It's a common response to stress – and most of the time, it happens in our sleep. Here’s how give those precious teeth and aching jaw muscles a rest. Our teeth do so much for us. They’re sturdy little pearls, made up of strong, bone-like tissue and wrapped in shiny protective enamel. But they’re not designed to be clenched together for too long, or to forcefully grate against each other. Many of us do this without even realising – gritting or gnashing our teeth through a stressful day, grinding them rhythmically back and forth in our sleep. When it becomes a regular pattern, it can cause persistent aches and pains, and potentially more serious damage to the teeth and jaw. The cause of teeth clenching and grinding – known as bruxism – can be mysterious. For many people, it seems to be a result of emotional stress, anxiety, tension or anger. But there’s a range of factors that could also be at play. Smoking, caffeine, alcohol and some drugs are all thought to have links. It can also be genetic, or related to other disorders such as sleep apnoea. In children, teeth grinding is common, but because their teeth and jaws grow so quickly it often resolves itself over time. Talk to your GP to try to determine the cause of your grinding – this will help guide how to best treat it. Teeth grinding or clenching most commonly happens in our sleep, which can make it tricky to control or even identify. Often, people only realise they’re doing it when their partners complain. It can sound like stones grinding together – not the most soothing sleep soundtrack. But there are some other clues that could suggest you have a bruxism issue, says MC Dental dentist Dr Jenifer Jiang. Waking up with an aching jaw or a dull headache are telltale signs. What problems could it cause? Treating your bruxism is important not only for soothing these aches and pains, but for protecting your teeth from damage. 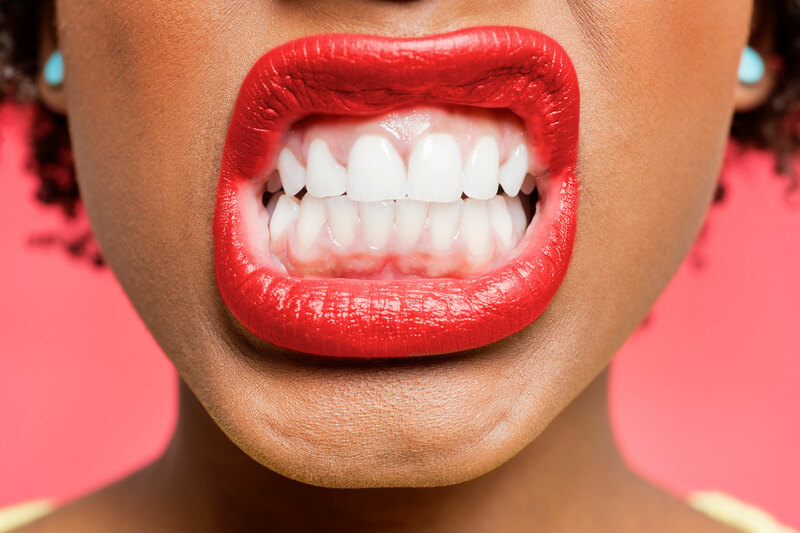 Grinding your teeth together puts a lot of pressure on them, which can wear down their protective enamel, potentially leading to some serious issues. “Over time, you might have some worn tooth surfaces. You can also get microfractures – tiny cracks in the teeth. Or you might wake up with a chipped tooth from grinding,” Dr Jiang says. If you have restorative dental work like fillings and crowns, grinding can also cause damage to these. Along with tooth damage, there is also potential for damage to the temporomandibular joint (the jaw joint, or TMJ), which can be difficult and expensive to treat. To protect your teeth at night, your dentist can fit you with a custom moulded mouthguard called an occlusal splint, which you wear over your teeth while you sleep. This won’t necessarily stop the grinding action itself, but it will prevent further wear and damage to the teeth, and help give your jaw and face muscles a rest. In some cases, your doctor might prescribe you medication that can relax the jaw muscles, reducing the grinding. Relieving stress is another key way to reduce your clenching and grinding. Relaxation techniques like meditation, mindfulness and breathing exercises can all be helpful, as can counselling and therapies like cognitive behavioural therapy. The Sleep Health Foundation also suggests developing good sleep habits to increase your chances of a calming night’s rest – for you and your jaw. This includes creating a soothing wind-down routine before bed, reducing your use of caffeine, nicotine and alcohol (especially at night), and making sure your bedroom is cool, dark and quiet. If your stress is overwhelming, or you think your teeth grinding might be a result of depression or anxiety, it's important to seek help. See your GP to discuss your symptoms and put together a mental health care plan. You can also start by seeking more information about mental health from Beyond Blue. What if you’re clenching during the day? If you’re clenching and grinding during the day, the first step is to bring your awareness to it, so you can start to break the habit loop. Notice when your jaw is tense, and make a conscious effort to relax it. You might start to recognise triggers that are making you clench. Over time, you’ll get better at consciously relaxing, reducing the frequency and severity of your bruxism.